Who said you can’t camp and enjoy the California wine country at the same time? 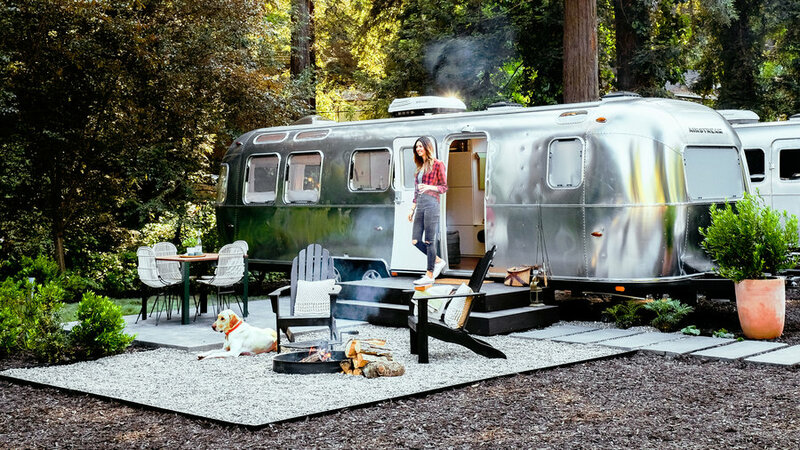 (Airstream from $200/night, luxury tent from $175/night) has both sleek custom Airstreams and canvas tents fit for even the most hesitant camper. You’ll sleep easy on a plush queen-sized Casper mattresse and comfy sheets. The firepit and deck are perfect for rela with a glass of wine. 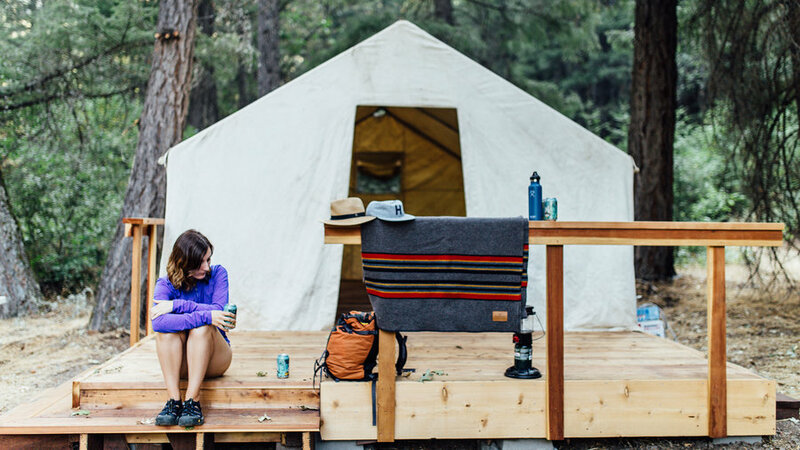 Only an hour outside of Shasta, this campsite features a doorless, redwood-lined wall tent and a private waterfall complete with a deep swimming hole. Four comfortable cots and a flushing toilet make it easy to feel at home in this secluded spot. Seek space and solitude at this off-the-grid retreat on the Navajo Nation in northern Arizona. 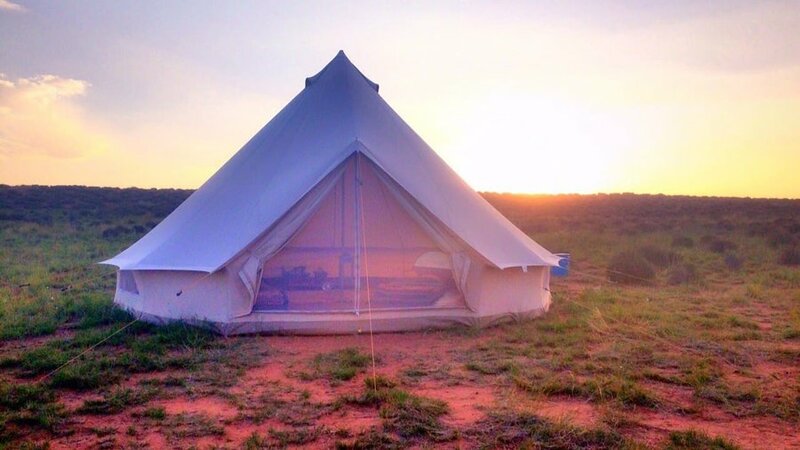 The bell tent overlooks pastoral grazing lands and vibrant red rock formations. The property also has covered wagons, a traditional Hogan, and a cabin. You won’t have to bring much. Bedding, including warm wool blankets and sleeping bags, lights, snacks, water, and toiletries (toothbrush included) are provided. Explore the beauty of Whistler without trucking in all of the gear. Whether you go in winter to ski or summer to relax and hike, the yurts at Riverside Resort are a perfect basecamp. The yurts have just about everything you would need including bedding, water, and towels. Bring your own cooking gear or head a mile and a half down the road to dine in one of the top restaurants at Whistler Village. 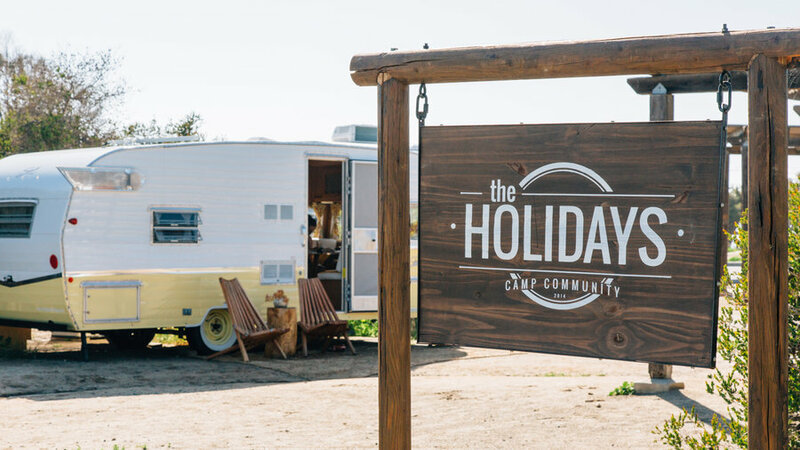 Nestled along San Clemente State Beach, The Holidays Camp Community includes four cozy vintage campers with modern amenities including running water and solar-powered lights. Spend the day exploring the beach or playing games around the communal firepit. You can rent a generator to power the air conditioner and outlets, but cool nights on the coast mean that you won’t be needing the A/C anyways. 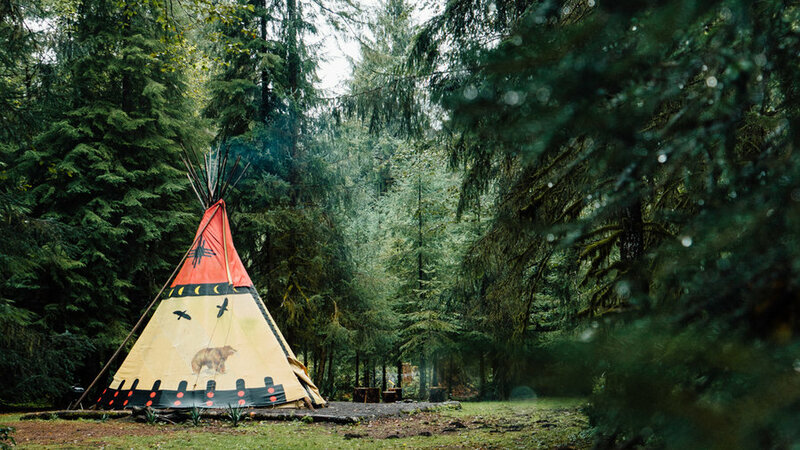 Make your childhood dreams come true by camping in this 22-foot tipi that’s big enough to comfortably sleep six. A wood-burning stove keeps the tent cozy while the outdoor firepit is the perfect spot to roast marshmallows. With an outdoor solar shower and composting toilet you aren’t totally roughing it. The tipi is only a short walk to a small waterfall along the North Fork Nehalem River. 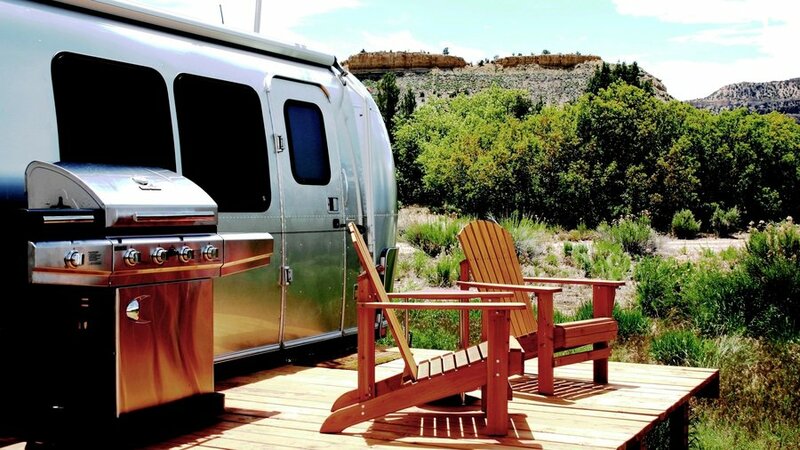 Stay in one of eight Hollywood-themed Airstreams and enjoy everything the desert has to offer. Air conditioning and heat will keep you comfortable. Hike to during the day and spend the evening in a classic car at the onsite outdoor movie theater. Explore the beauty of Wyoming without the Yellowstone or Teton crowds. 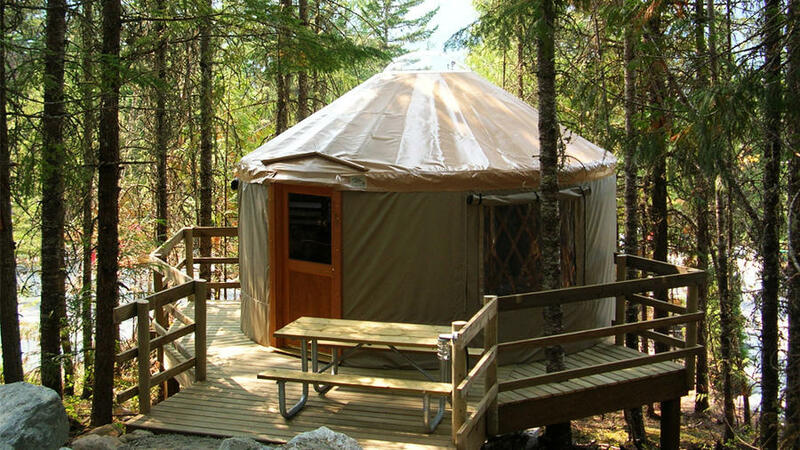 The four yurts are the perfect place to put your feet up after hiking around the falls, admiring the wildflowers, and watching wildlife like moose, mule deer, porcupines, and black bears. 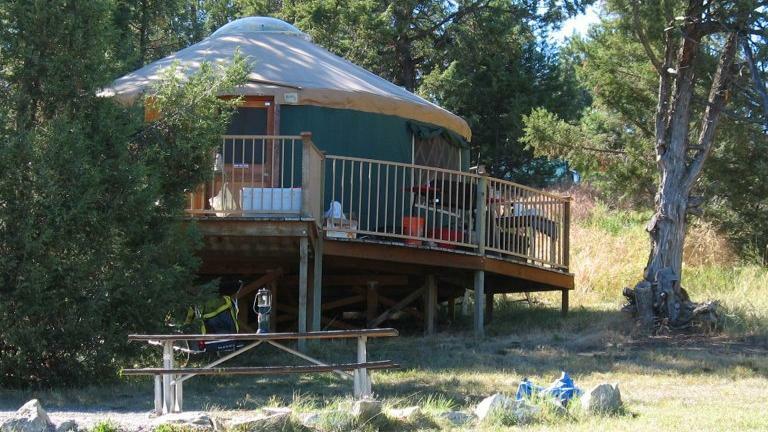 Each yurt has room for four to five and includes electricity and a heater so you can stay warm on cool nights. 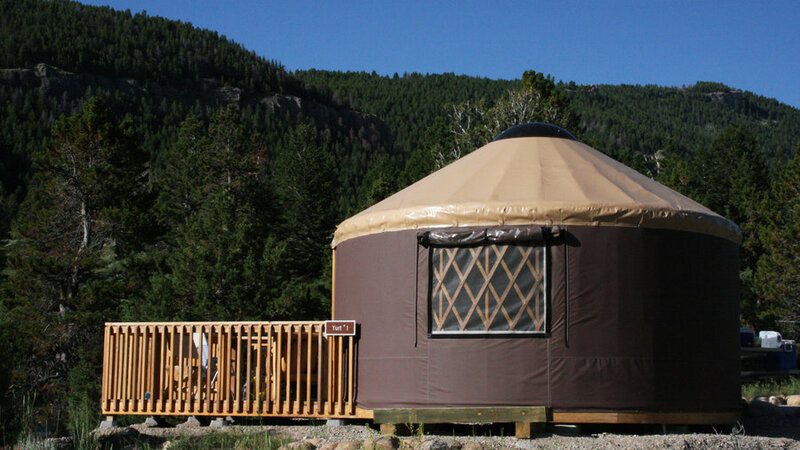 While you can reserve up to 48 hours in advance, the yurts fill up fast during peak season. Camp within walking distance of the beach at the Cape Disappointment yurts. The structures feature ADA-accessible ramps and decks so everyone can enjoy the experience. 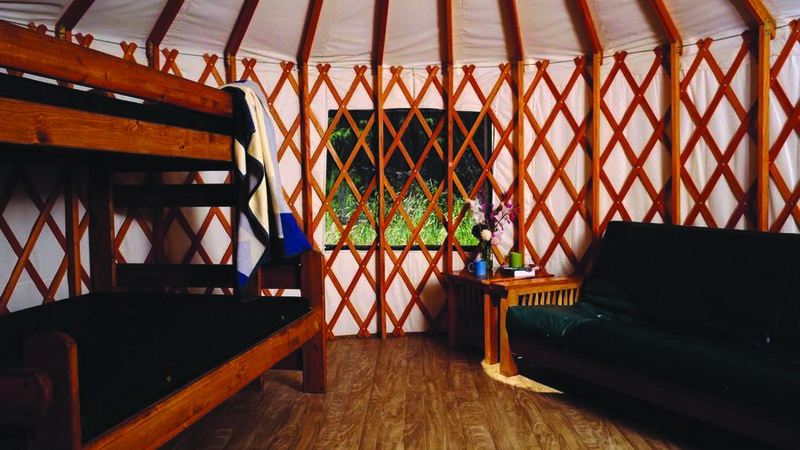 Each 16-foot yurt has plenty of room for six guests to relax, but you’ll want to spend most of your time exploring the park. Nestled along the Columbia River and the Pacific Ocean, the park is home to both sandy beaches and forests. Don’t miss the historic fort and two lighthouses. Relax on the shores of Flathead Lake while camping at Big Arm. The yurts are within walking distance of a calm bay where you can fish, swim, and set out on the water. Bring the blender! The yurts have electricity, heat, and a firepit. They fill up fast during peak season – be sure to reserve as soon as they open up nine months in advance.